Scythes are normally used as tools by farmers to cut the grass or reaping crops. There were also War Scythes and similar weapons used in the 19th century and the Grim Reaper himself is often illustrated using a Scythe as well. 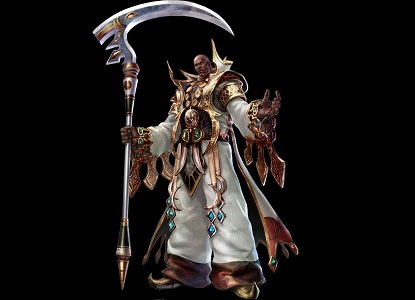 In video games there are a few characters using a Scythe as well as a weapon, like Death from the Castlevania games or Zasalamel and his evil counter-part Abyss from the SoulCalibur games. Akechi Mitsuhide from the Sengoku Basara games uses two scythes at the same time.